Microsoft Excel is perhaps the most popular data anlysis tool out there. While arguably convenient, spreadsheet software is error prone and Excel code can be very hard to review and test. After successfully completing this exercise set, you will be able to prepare a basic Excel document using just R (no need to touch Excel yourself), leaving behind a reproducible R-script. Install and load the xlsx package, using the dependencies = TRUE option. Create an xlsx workbook object in your R workspace and call it wb. Create a sheet object in wb named iris assign it the name sheet1 in your workspace. Write the built-in Iris data.frame to the iris sheet without row names. Hint: use the addDataFrame() function. Now you can write your workbook anytime to your working directory using saveWorkbook(wb, "filename.xlsx"). Apply ‘freeze pane’ on the top row. Set width of columns 1 through 5 to 12, that is 84 pixels. Use Font, CellBlock and CB.setFont to make the header in bold. 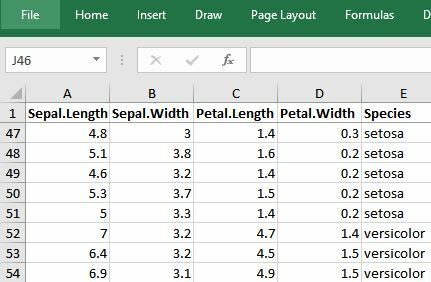 Using tapply generate a table with the mean of ‘petal width’ by species and write to a new sheet called pw, from row 2 down. Add a title in cell A1 above the table, merge the cells of the first three columns. Save your workbook to your working directory and open using Excel. Go back to R and continue formatting and adding information to your workbook at will.